SOLD!! MORE PROPERTIES WANTED IN MACEDON RANGES! Within minutes from Mount Macedon’s hub is a superior residence set in its own private sanctuary filled with mature European trees and the sounds of the crystal clear running water of Turritable creek. Very limited street view protects the privacy of the upmarket home with its high scale presentation and design. Comp: 3 bedrooms, plus study, vast living spaces and undercover accommodation for five cars. Some of the outstanding features of this high quality property are the superb solid Rose Gum floor boards throughout, a double sided slow combustion wood fire inset into a stacked stone parting wall between the formal lounge and dining, soaring ceilings and German engineered double glazed windows that have mesmerising views of the garden from the large conservatory windows. The entertainer and accomplished chef have not been forgotten with stone benchtops to the large central kitchen, European appliances including double ovens, huge pantry, integrated dishwasher, Blum soft closers to all pot drawers, instant steaming hot water tap to sink and an insinkerator as well. 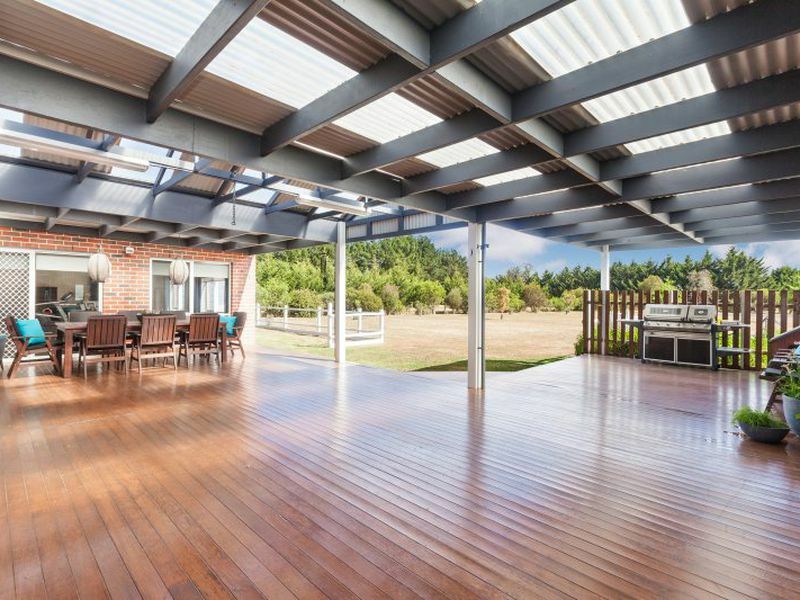 You are spoilt for choice when entertaining, with a rear under cover enclosed deck, large open decks and reclaimed red brick paved area’s to the north side under the tree canopy. Other significant features of this property include: Ornamental dam, seasonal creek boundary, orchard, vegetable garden, watering system throughout, town water & fresh water tanks (approx. 40,000 ltrs), ceiling fans, split system air conditioning, shed approx 12m x 8m incorporating huge workshop, heated towel rails and IXL heat lamps and stone bench tops to both bathrooms, mirrored sliding wardrobe doors to bedrooms, tinted north facing windows, solar panels, separate fenced back yard, opposite Stanley Park with its waterfall. Set amongst mature Redwoods, Pin Oaks, Canadian Maples and Spruces and walking distance to Mount Macedon Primary school, Mount Macedon Hotel & the Trading Post, properties like this are held tight and are rarely available for the sale market.